incorporated into the relevant sections of the Accounting Standards Codification (ASC). with the earnings process (i.e., gains). concept and the net concept. Know the difference between a multiple-step income statement and a single-step income statement. revenues; thus, the income statement has a single step. permissible. Review the terminology and be able to recognize a classified balance sheet. © Becker Professional Education Corporation. All rights reserved. Step 1: Identify the Contract With the Customer. contract and are potentially modified when the price and/or scope changes. must be available to the customer independently or when combined with their own resources. Step 4: Allocate the Transaction Price to the Separate Performance Obligations. price changes should all be factored into the allocation process. Step 5: Recognize Revenue When or as the Entity Satisfies Each Performance Obligation. output or input methods) or at a point in time. generate/enhance the resources of an entity, and be expected to be recovered. equal to a fee/commission will be recognized. transfer to the purchasing customer. customer or after the expiration of a defined period of time. is lengthy, and if there are no specific tasks required regarding compliance assurance. based on estimated profitability and cost estimates following a four-step process. method does not match revenues and expenses over the long term. Both methods recognize estimated losses immediately. to the extent of costs incurred. reported as part of discontinued operations in the year incurred. is classified as "held for sale." operations and financial results to be reported as a discontinued operation. change in estimate and is accounted for as a change in estimate. "old" method to the "new" method at the beginning of the earliest year presented. (e.g., changing to U.S. GAAP LIFO from any other inventory method). concept of a change in entity. Error corrections are reported net of tax in the statement of retained earnings. Comprehensive income includes all changes in owners' equity other than transactions with owners. comprehensive income but excluded from net income under U.S. GAAP. The mnemonic PUFER represents the five commonly tested sources of other comprehensive income. of other comprehensive income. Accumulated other comprehensive income is an owners' equity item. recognized through year-end and make the appropriate adjusting journal entry. have been incurred through year-end and make the appropriate adjusting journal entry. the financial statements are in accordance with the accrual basis of accounting. Adjusting journal entries never involve the cash account. The Summary of Significant Accounting Policies reflects the methods and policies employed by the firm. changes in accounting principles or implementation of new accounting standards updates. statements, certain significant estimates, and current vulnerability due to certain concentrations. they comply with all IFRS requirements. U.S. GAAP does not have a similar requirement. settle all its obligations for the foreseeable future. continue as a going concern within one year after the date that the financial statements are issued. conditions or if events will be successful in alleviating the substantial doubt. disclosures); and substantial doubt not alleviated (requires footnote disclosures). 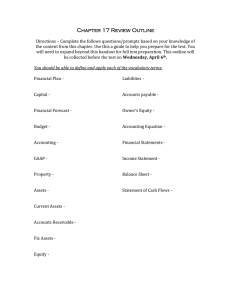 financial statements are issued or are available to be issued. nonrecognized subsequent events in the financial statements. evaluate subsequent events through the date that the financial statements are issued. Revised financial statements are considered reissued financial statements. measurement date under current market conditions. pricing of asset) or liability (minimizes payment to transfer liability), after considering transaction costs. these approaches when measuring the fair value of an asset or liability. techniques. Level 1 inputs have the highest priority and Level 3 inputs have the lowest priority. The valuation techniques and inputs used for fair value measurement of assets and liabilities. fair value cannot be measured with sufficient reliability. 1. Ten percent of combined revenues to internal and external parties. 2. Ten percent of the greater of reported profit or loss (as an absolute amount). 3. Ten percent of the combined assets of all operation segments. least 75 percent of revenue from external parties. does not require a disclosure of segment liabilities. segments, including: products and services, geographic areas, and major customers. 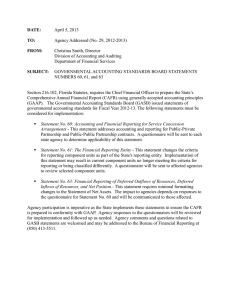 fiscal year for accelerated filers; and 90 days after the end of the fiscal year for all other registrants. 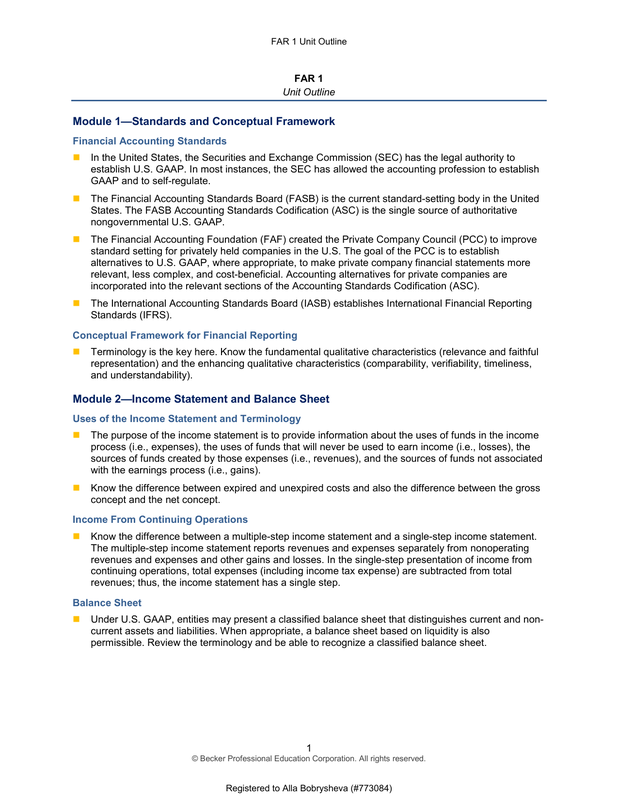 discussion and analysis (MD&A), and audited financial statements prepared using U.S. GAAP. statements to be filed with the SEC. applicable financial statement schedules in an exhibit prepared using XBRL. statements prepared using the cash basis, the modified cash basis, and the income tax basis. important to investors, lenders, and other interested parties. Liquidity ratios are measures of a firm's short-term ability to pay maturing obligations. Activity ratios are measures of how effectively an enterprise is using its assets. Profitability ratios are measures of the success or failure of an enterprise for a given time period. Coverage ratios are measures of security or protection for long-term creditors/investors. Restricted cash must be segregated from other cash. side, and adjusting journal entry information provides adjustments on the book side. receivables can be recorded using either the gross method or the theoretically preferred net method. Trade discounts are applied sequentially and receivables are recorded net of any trade discount. Direct write-off method: used for tax; it is not GAAP. Allowance method is GAAP. The allowance for uncollectible accounts is a contra-asset. amount determined by an analysis of the A/R schedule. allowance and then record the collection in the normal way. assignee assumes the risk of loss. can be used to establish when a purchase or sale has occurred. Sales with a right of return still count as sales if returns are estimable and other conditions are met. Consigned goods belong to the consignor. IFRS) are departures from cost basis caused by a decline in the inventory's utility. that is costed using LIFO or the retail inventory method. realizable value is used for all inventory that is not costed using LIFO or the retail inventory method. purchases with a debit to purchases. period after taking a physical count. both periodic and perpetual systems. net income than other methods in a period of rising prices. Weighted average is called "moving average" in a perpetual inventory system. historical gross profit or cost complement percentage. market price and if it is expected that losses will occur when the purchase is actually made. substance, are long-term in nature, and are subject to depreciation. Donated fixed assets are recorded at fair value and a gain or revenue is recognized equal to that value. Under IFRS, fixed assets are recorded upon acquisition at historical cost to acquire and put into use. use. Land is not depreciated. Land improvements have finite lives and should be depreciated. appraised value of individual items. overhauls or major replacements, should be capitalized. incurred during the construction period. depreciation arises from obsolescence or inadequacy of the asset to perform efficiently. components that are replaced should be derecognized. IFRS requires component depreciation. The composite and group depreciation methods depreciate an entire class of assets over a single life. U.S. GAAP allows component depreciation and composite/group depreciation. pattern of fixed asset consumption. U.S. GAAP does not have the same requirement. number of units expected to be produced. write off of fully depreciated asset, and permanent impairment. Depletion is similar to the units-of-production method, except the former is applied to "wasting"
assets. Restoration costs should be included in the depletion base. Under U.S. GAAP, exchanges having commercial substance affect future cash flows. comparison to the "old" asset's fair value. generate revenue and no gains are recognized. Under U.S. GAAP, exchanges lacking commercial substance do not change future cash flows. All losses are recognized in these exchanges. greater than 25 percent of total consideration, recognize all gain. cash, the entire gain or loss is recognized for financial accounting purposes. business enterprise, including patents, copyrights, trademarks, and goodwill. capitalized if certain criteria are met. and impairment. Under IFRS, intangible assets may be reported using the cost model (same as U.S.
GAAP) or the revaluation model. revaluation gains are generally reported in other comprehensive income. 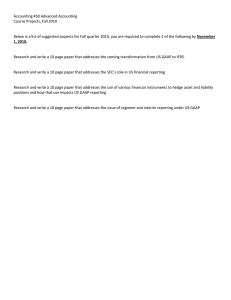 U.S. GAAP requires research and development (R&D) expenditures to be expensed as incurred. costs as cost of goods sold. Under U.S. GAAP, if computer software is to be sold, leased, or licensed, the time line is the key. costs after selling has started. greater of two methods: percentage of revenue or straight-line. amortized on the straight-line basis. must be expensed and development costs may be capitalized if certain criteria are met. asset is held for disposal. expected from the intangible asset. IFRS allows the reversal of impairment losses. than the carrying amount, an impairment loss needs to be recognized (go to Step 2). amount exceeds the fair value of the asset. "rebound," no restoration is permitted. Restoration is permitted under IFRS. 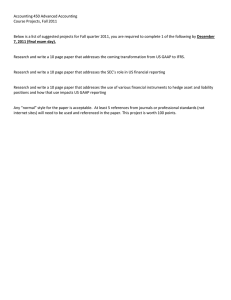 prior to sale, a restoration is permitted under both IFRS and U.S. GAAP. or financial instruments, or exchanges such as derivatives contracts with potentially favorable terms. (including derivatives contracts) with potentially unfavorable terms. redeemable preferred stock, and convertible debt. reported at fair value in the financial statements through the use of a valuation account. Unrealized gains or losses are reported on the income statement. other comprehensive income (the "U" in the PUFER mnemonic). maturity. The portfolio itself is reported in the financial statements at amortized cost. of stock (warrants, stock rights, call options), and rights to dispose of shares of stock (put options). or similar investments, less impairment. encouraged but not required under U.S. GAAP. subsequently measured at either amortized cost or fair value. company is presumed significant influence (with exceptions). investment account is similar to a bank account. the excess value of land and goodwill are not amortized. Be familiar with the diagram in the text comparing fair value and equity methods. holding gains and losses in other comprehensive income are recognized in earnings. sufficient financial resources to support its activities. expected VIE losses or receives the expected VIE residual returns. and securities issuance costs reduce additional paid-in capital. I—The parent company's investment in the subsidiary is eliminated. N—Noncontrolling interest is created if the parent owns less than 100 percent of the subsidiary. percentage acquired) are recorded at fair value. I—Identifiable intangible assets of the subsidiary are recorded at fair value. intangible assets are still adjusted to fair value and the negative balance is recorded as a gain. Review the year-end consolidated workpaper eliminating journal entry in the text. the investment in subsidiary in its accounting records. See noncontrolling interest calculation for IFRS under the partial goodwill method (below). New subsidiary assets and liabilities that existed on the acquisition date may be recognized. Eliminate 100 percent, regardless of whether there is a noncontrolling interest. intercompany profit is allocated between the purchaser's ending inventory and cost of goods sold. issuer's balance sheet and the investment in bonds account from the balance sheet of the investor. Do not assume that the issuer sold these bonds directly to the investor. that had been in the seller's books and also eliminate the gain/loss. sale must be adjusted back to what it would have been had the transaction never occurred. all of the subsidiary's revenues and expenses after the date of acquisition. The subsidiary's preacquisition revenues and expenses are not included in the consolidated income statement. comprehensive income attributable to the parent company. attributable to the parent, and equity attributable to the noncontrolling interest. cash due to operating, investing, and financing activities during the period. 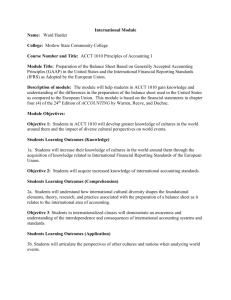 journal entries and the preparation of consolidated financial statements. the carrying amount of the reporting unit goodwill exceeds its fair value. whichever is longer. Current liabilities are valued at their settlement values or net realizable values. anticipated and journalized. The purchase may be recorded gross or net. purchase of goods, supplies, or services. Trade notes payable may include a stated interest rate. statement date (such as wages, utilities, rent, etc.). Taxes payable may include property, sales, and income taxes due but not yet paid. Medicare, and income taxes are withheld from employees out of the gross pay of their paychecks. expense, but credited to a payable account until remitted. present value of the future obligations. expense due to the passage of time, and depreciation expense is recognized on the ARC asset. Contingencies are existing conditions whose outcome depends on some future event or occurrence. The three categories of contingencies are probable, reasonably possible, and remote. A loss contingency involves a possible future loss whose existence is proved by subsequent events. valid upon the occurrence of future events. Gain contingencies that are probable are not accrued but are disclosed. minimum amount is accrued and the remaining amount is disclosed in a footnote. footnotes and is not accrued. expected amounts are probable and can be reasonably estimated. Review the time value of money formulas and examples in the text. that are not payable within the current operating cycle or reported year, whichever is greater. present value at the date of issuance. the actions of debtors that might negatively affect the positions of the creditor. redeemed at the face value without periodic interest payments. Review the chart in the text that compares bonds (payable) with notes (payable) attributes. will adjust the price paid for the bonds to reflect the market, or effective, interest rate. present value of future interest payments, both discounted at the effective (market) interest rate. coupon rate is below the market, the market will adjust and the bond will sell at a discount. effective interest method of premium/discount amortization. and amortized using the effective interest method. and they are amortized to interest expense using the straight-line or effective interest method. (U.S.
Interest is accrued at year-end from the last interest payment date. supported by comments, and schedules in the accompanying notes. combination of asset transfer, equity transfer, and modification of terms. transferred exceeds the face of the payable. it exceeds the total future cash payments specified under the new terms. modification of terms associated with the impairment. replaced with a new issue at a lower interest rate. is considered extinguished if the debtor pays or the debtor is legally released. property (an asset), and a lessee, who agrees to pay periodic rents over a specified time. expense/revenue calculation and are treated as deposits. or the life of the improvement. Ownership transfer to lessee at end of lease. Written bargain purchase option exists (purchase option < estimated fair value). The lease term is ≥ Seventy-five (75) percent of the asset's economic life. risks and rewards of ownership to the lessee. are added to the amount recognized as a finance lease asset. incremental borrowing rate. The lease liability is amortized using the effective interest method. the term), in which case the asset life is used for depreciation. financing lease is referred to simply as a finance lease. are received, interest revenue is also recognized by the effective interest method. not recognize gross profit on sale. Interest revenue is recognized by the effective interest method. single financing transactions, in which profit may be deferred and amortized. assuming that there was no leaseback. the life of the leased asset. lease), with any excess gain recognized immediately. equals fair value (general rule), gains are recognized immediately (no deferral). (currency units, shares, pounds, etc.). Require little or no initial net investment. an asset that gives substantially the same results. Market risk and credit risk are the inherent risks of all derivative instruments. depends on the derivative designation (per below). similar to the treatment of trading securities. investment in a foreign operation. Specific disclosures are required for all companies that hold derivatives. statements expressed in the domestic currency (the dollar). various exchange rate definitions and the distinction between monetary and nonmonetary items. remeasurement (temporal) method and/or the translation (current rate) method. functional currency of the foreign subsidiary. Remeasurement gains and losses are reported on the income statement. Translation gains and losses are reported in other comprehensive income (PUFER). additional gain or loss is reported when the transaction is settled in the foreign currency. between the financial and tax accounting rules. Only temporary differences cause deferred tax consequences. the tax rate. The exam routinely ignores estimated tax payments by firms. therefore they only affect current tax paid and not the deferred tax accounts. Temporary differences will "turn around" in the future and are part of the deferred tax calculations. liabilities or bad debt expense. will result in lower taxable income in the early years of the asset life and a deferred tax liability (DTL). taxable profit will be available against which the temporary difference can be utilized. reflecting a tax benefit in a company's financial statements. periods the taxable item is expected to be paid (liability) or realized (asset). when the tax rates change. continuing operations in the period of the change. allocated to other items must be disclosed. The candidate should review the Corporation Tax Summary in the text. A defined benefit pension plan has two main components: plan assets and pension plan liability. current and past compensation levels. Under IFRS, the pension plan liability is called the defined benefit obligation (DBO). should be presented on the income statement, separately or in total, below income from operations. A plan is underfunded when the PBO (or DBO) exceeds the fair value of the plan assets. Under U.S.
liability. 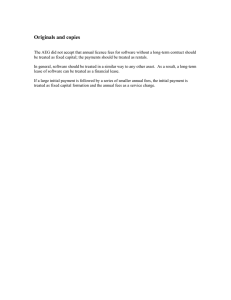 IFRSs do not specify whether the liability should be reported as current or non-current. A plan is overfunded when the fair value of the plan assets exceeds the PBO (or DBO). Under U.S.
the asset should be reported as current or non-current. are several exceptions noted in the text. There are extensive required pension plan footnote disclosures. A list is provided in the text. Postretirement benefit plans must be reported as described above for pension plans. have vested as of the measurement date. The APBO is discounted using an assumed discount rate. present value of expected future benefits that have not yet vested. status of each plan is calculated separately. The required disclosures are the same for pension plans. statements be presented by the pension plan itself. the net assets available for benefits at the end of the plan year. regarding the changes during the year in the net assets available for benefits. accumulated plan benefits as of either the beginning or end of the plan year. about the ability of the plan to meet future obligations. investments carried at fair value and investments carried at contract value. preferred stock is reported as a liability because it has a maturity date, like other debt instruments. the par value of shares issued. changes in accounting principles, and quasi-reorganizations. including the retirement of treasury stock. Donated shares result in a credit to contributed capital. Stock subscriptions are contracts to buy a stock at a future date. Dividends declared reduce R/E on the declaration date. recorded at fair value on the declaration date. Large stock dividends are recorded at par value. Stock splits do not require a journal entry and total book value of C/S is unchanged. company's primary equity components for a stipulated period(s). the individual exercising the option to have a potential profit at the moment of acquisition. options or purchase plans can be either noncompensatory or compensatory. Substantially all full-time employees meeting limited employee qualifications may participate. The time permitted to exercise the rights is limited to a reasonable period. characteristics are usually classified as compensatory plans. period is the vesting period, which is the time between grant date and the vesting date. do not require the employee to make a cash payment. has a simple capital structure. common shareholders by the weighted average number of common shares outstanding. common stock and would therefore dilute or reduce EPS. options were exercised. Antidilutive securities are not considered. not available for common shareholders and preferred dividends do not reduce net income. Contingent shares, if dilutive, are part of the basic EPS calculation if all conditions for issuance are met. Basic and diluted EPS are disclosed by income statement component for a proper presentation. notes payable and the current portion of long-term debt are reported as financing cash flows. Cash Flows From Investing (CFI): Cash receipts and disbursements from non-current assets. (including non-current liabilities) and equity. used, by operating activities. The mnemonic CLAD is useful to remember the various adjustments. to cash provided by operating activities" is required under U.S. GAAP, but is not required under IFRS. table in the text for individual transaction classifications. interest received and dividends received may be classified as CFO or CFI. interest paid is classified as CFO and dividends paid are classified as CFF. either the indirect or direct methods. voluntary health and welfare organizations (e.g., United Way), and other nongovernmental, not-forprofit entities (e.g., museums). All of these entities use full accrual basis of accounting. The accounting rules for these entities come from the FASB Accounting Standards Codification® (ASC). 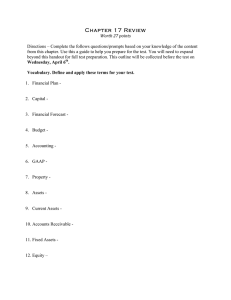 statements, or in a separate financial statement (no specific title provided by the FASB). Know that internal board-designated funds are classified as net assets without donor restrictions. donor restrictions and is reclassified to net assets without donor restrictions. the purchase of long-lived assets is classified as an operating activity on the SOCF. after treating the entity's estimate of uncollectibility as an allowance for uncollectible accounts. Conditional promises are not recognized as revenue until the condition has been satisfied. to be used to acquire other assets for the collection. depending on the form of the benefits received. transferred is classified as contribution revenue. determined by subtracting canceled classes from assessed student tuition and fees. allowance that reduces revenues or as an expense. poverty guidelines) are not recorded as revenues because there was no intention to collect. or collectability of the related patient account receivable. Nonoperating revenue includes all unrestricted gifts and donations plus donated services. be accounted for, as (1) a contribution, (2) a liability, or (3) a change in interest in net assets. One organization has an ongoing economic interest in the net assets of the other. the recipient and the beneficiary are financially interrelated. contribution, a beneficial interest, or a change in interest in the net assets of the recipient. measured at fair value in the statement of financial position. restricted, either temporarily or permanently, by explicit donor stipulations or by law. which the gains and income are recognized. Investment returns are reported net of any related investment expense. and will be accompanied with specific disclosures. major categories of funds are governmental (GRaSPP), proprietary (SE), and fiduciary (PAPI). financial statements and required supplementary information. funds are the general, special revenue, debt service, capital projects, and permanent funds. two proprietary funds. Proprietary fund accounting is similar to commercial accounting. purpose, and investment trust funds. focus. It is a blend of accrual and cash basis accounting concepts. identical to the accrual basis used in commercial enterprises. Budgetary: Budgetary accounting is used to control spending. Activity: Activity accounting emphasizes the flow of current financial resources. close them out at the end of each year (BAE BAE). control (a budgetary equity account). A projected shortfall, or deficit, would be debited to that account. This entry is closed (reversed) at the end of the year. accrued if measurable and collected within 60 days after fiscal year-end (available). insurance, and inventory can be accounted for by the purchase method or consumption method. governmental fund. Instead, long-term debt is classified as other financing source on the governmentwide financial statements. for the amount originally recorded and the actual expenditure is recorded in a separate J/E. nonreciprocal interfund transfers or reimbursements. position and are reported following liabilities but before equity. likely funds in which the classifications would be used. activities of a government that are not accounted for by any other fund. typically restricted or committed to specific purposes other than debt service or capital projects. Expendable trusts and grants are special revenue funds with unique accounting issues. debt incurred by governmental funds. Other (SE-PAPI) funds service their own debt. or special assessments charged to property owners benefited by the project. revenues, expenses, and changes in net position; and a statement of cash flows. the pricing policies of the activity establish fees and charges designed to recover its costs. external customers and internal service funds serve the government. statement of fiduciary net position, with no fund balance reported. demonstrate compliance with government leaders' decisions (fiscal accountability); the governmentwide financial statements display achievement of operating objectives (operational accountability). expenses, and changes in fund net position; and a statement of cash flows. changes in fiduciary net position. considered a primary government and therefore have their own financial statements. separately elected leaders, is a legally separate entity, and is fiscally independent. It stands by itSELF. Net investment in capital assets net of accumulated depreciation and related debt. assets or the restricted component (no external restrictions). assessment of assets; and 2) an annual estimate of the amounts required to maintain the assets. maintenance is expensed, and additions or improvements are capitalized. eliminated; between columns, interfund activity will not be eliminated. service funds are excluded from major fund consideration. and changes in fund balance for governmental funds presented in the text. The direct method is required. financing activities, and investing activities. Financing activities are reported before investing activities. Interest income is an investing activity. Capital asset purchases are financing activities. outflows of resources and liabilities plus deferred inflows of resources. focus, basis of accounting, and excluded funds. description of major initiatives and analyze material variances. funds in aggregate, as well as additional information regarding discretely presented component units. and budgetary comparisons of the original and final budgets as well as the actual amounts. Combining statements for nonmajor funds and variance computations is optional.